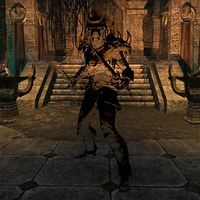 The Dark Mane is an evil Khajiit Dro-m'Athra who has possesed mane Akkhuz-ri and unleashed Dro-m'Athra upon Reaper's March. According to legend, the Dark Mane was the leader of the Khajiiti people in ancient times. He fell from grace, and was cast out of the Moon's light, forced to walk in darkness for all eternity. Mane Akkhuz-ri: "Please... I can't take any more." Dark Mane: "This one knew the vessel was weak." Dark Mane: "The Tharn will be displeased." Dark Mane: "End this flesh before you. It is not fit to breathe." Dark Mane: "We will meet again." This page was last modified on 22 February 2019, at 03:42.